Browned butter may sound fancy or complicated, but it’s literally butter that has been cooked until it starts to lightly (that’s the key – lightly) brown, and take on a toasty, caramel-lye sweetness. You won’t believe how much flavor it can add to any simple dish, such as this very simple sautéed vegetable recipe. 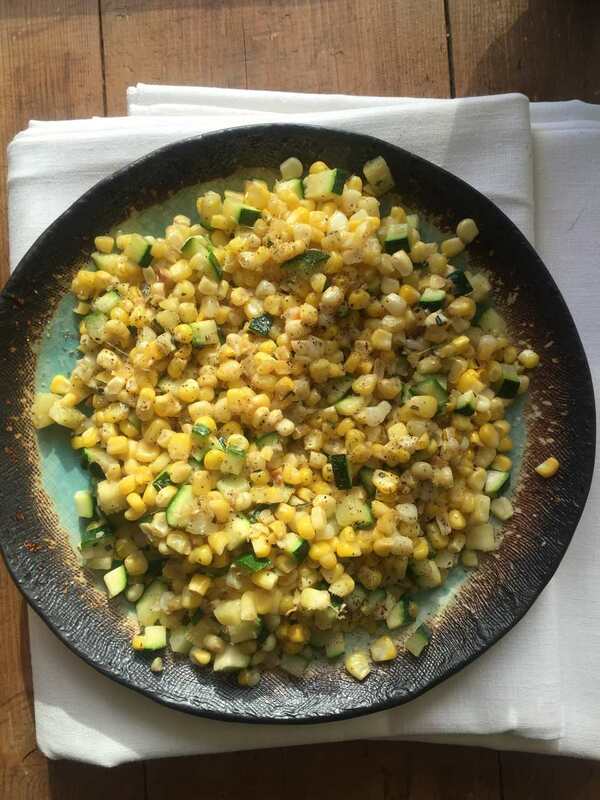 This is a perfect summer side dish, especially if you can make this with fresh corn, but it’s also lovely heaped on a plate for a lunch with a poached or fried egg on top. Lemon zest is one of those ingredients that can really perk up a dish. Before you juice a lemon for any recipe, consider removing the zest and keep it in a container in the fridge for several days, and adding it to recipes to give them a pop of flavor. Stews, soups, salad dressings, sauces, marinades, and so on and so on. Use a microplane, sometimes called a zester, which will give you fine little shreds of zest which blend nicely into various dishes. When you are zesting a piece of citrus fruit make sure you don't scrape too far - you only want the brightly colored outer layer of the skin. The white underneath is bitter, so you want to avoid that. Try other herbs in place of the rosemary – anything really works here. In a large skillet melt the butter until slightly browned over medium heat. Add the corn, zucchini, garlic, lemon zest, and rosemary. Season with salt and pepper and sauté for about 6 minutes until the vegetables are crisp tender. If you are using citrus zest regularly, you’ll want to invest in a microplane, which is actually a very versatile and inexpensive tool. It makes lovely and fine fluffy curls of zest. It also works wonders on hard cheese, such as Parmesan, and chocolate, and is also a nice way to finely mince garlic or ginger. You can also use a vegetable peeler or a paring knife to remove the zest. And then if needed chop or mince the zest further. Wash your fruit before zesting. The most important thing is to just remove just the thin, colored skin—called the zest—of the fruit. Don’t dig into the soft, white pith that lies underneath, which has a bitter, overpowering taste. A microplane is also gentle, so doesn't dig into the pith.